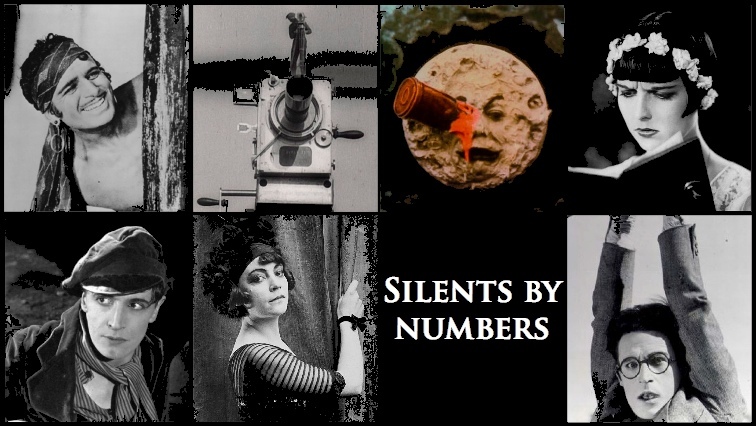 This is a guest post for Silent London by Robert Seidman, author of Moments Captured, a novel based loosely on the work and life of the pioneering 19th century photographer Eadweard MuybridgeThe Silents by Numbers strand celebrates some very personal top 10s by silent film enthusiasts and experts. In 1878 Eadweard Muybridge (1830-1904) created the mechanism that recorded the first photographs of a horse trotting. No photographer had ever been able to capture such rapid motion before. 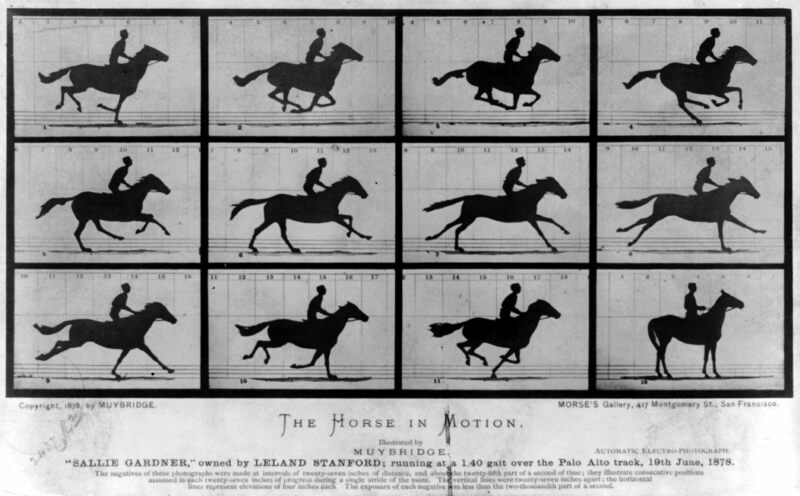 Muybridge’s multi-camera mechanism stopped time and seized motion itself so that he and his employer, California’s ex-governor Leland Stanford, could analyse the animal’s gait and improve the training of his racehorses. Muybridge was at a racetrack when two horses finished in a dead heat. The usual volatile debate followed about which animal had triumphed. The dispute tripped Muybridge’s innovative impulse, and soon Eadweard invented the first device to record the “photo finish”. In a letter to Nature magazine in May 1882, Eadweard Muybridge argued that every horse race should make use of a high-speed photo at the finish to determine the winner. A camera very much like the one that Muybridge deployed still determines the outcome of contested horse races. The idea of Muybridge’s photo finish was later expanded to include other sporting events, including foot races and swimming contests. Today, on TV and in film, the grace and agility of divers and swimmers, sprinters and footballers are presented in stop-motion, yet another of Muybridge’s contributions to the way we see and perceive. In January 1877, Muybridge placed his view camera on the roof of railroad magnate Mark Hopkins’ half-finished mansion in the posh Nob Hill neighborhood of San Francisco and began the process that recorded the most detailed and complete – though not the first – panoramic view of the city. Starting at 11am and using the contemporary equivalent of a telephoto lens, Muybridge took 13 photos as he carefully moved his camera around in 360 degree circle. 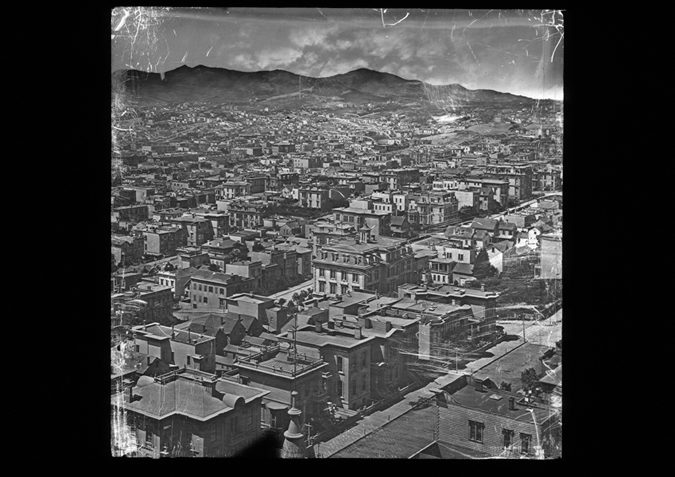 The panorama remains the most complete description of the City’s “Golden Era” before its partial destruction in 1906 by an earthquake and subsequent fire. Throughout the late 1860s Muybridge produced a stunning portfolio of the wild beauties of the American West, including breathtaking documentation of Yosemite before it became a national park. Multiple historians assert that the photos helped spur the National Parks movement itself. Theodore Roosevelt, the father of the US National Parks system, was directly influenced by Muybridge’s and other early photographers views of the American wilds.